YMCA of Portsmouth 2012 - Web Development Technology Partners, inc.
As a nonprofit, it is very important to us to have a usable and visually appealing website to attract potential members and donors, as well as having a venue to keep current members up-to-date on classes and events at the Y. 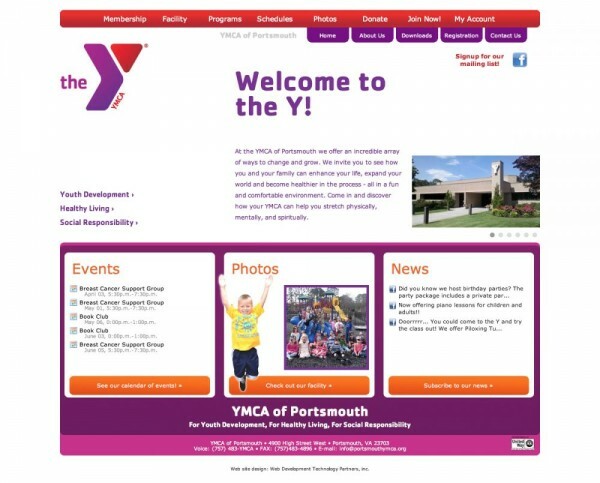 When the YMCA of the USA announced that we would be changing our visual identity and logo, we realized this would be the perfect opportunity to update the YMCA of Portsmouth website. We did some research, met with Rich, and knew WDTP, Inc. was the perfect fit for us. Our website now has a clean look with increased functionality that meets all the Y-USA graphic standards. Thank you to everyone at WDTP!